So, a phone or a camera, which is it? The Samsung Galaxy S4 zoom tries to be both, but it does better at one than the other. You should've all figured by now that it's the camera we're talking about. The S4 zoom has all the trimmings of a digicam. It can certainly do as a phone too, but a lower midranger, and not the most portable handset obviously. We've learned to live with tall and wide phones, but one as thick as the S4 zoom can be too much for some. In some cases, however, a crossover device has its advantages - vacationers will always have their camera on them and usually their phone, but with the Galaxy S4 zoom it's just one device to carry around. Similarly, passionate amateur photographers might find that the S4 zoom saves space. But other than that, we don't quite see it as an everyday device, certainly not when high-end smartphone cameras are as good as they are now. One can argue that an Android-powered camera will open new possibilities with its long optical zoom, great stabilization and powerful flash. This is where the Galaxy S4 zoom comes in - it's for early adopters who can't quite afford the Galaxy Camera or the Galaxy NX. The Samsung Galaxy Camera is last year's issue and is basically the same device as the S4 zoom only with more zoom (20x), bigger screen (4.8" 720p) and faster chipset (quad-core Exynos 4). There's no telephony though. The Samsung Galaxy NX is in a league of its own - it's an interchangeable lens camera (meaning it's a lot more flexible) with a much bigger sensor (APS-C has over 13 times the surface area of the 1/2.33" sensor in the Galaxy S4 zoom) and niceties like a hot shoe for an even more powerful flash than the built-in xenon, not to mention the full range of controls that go further than the S4 zoom's own manual controls. Then there's the Nokia Lumia 1020 with a 41MP optically stabilized sensor, xenon flash and lossless zoom (when you're shooting at 5MP). It's almost as compact as a proper flagship phone and has higher-end specs than the S4 zoom (4.5" WXGA AMOLED display, 1.5GHz Krait processor, etc.). It's as high as Windows Phone 8 handsets go. Samsung is making a name for itself as a company that isn't afraid of trying new things. It kick-started the phablet market with its successful Galaxy Note and now it may be about to do the same for the Android-powered cameras. Yes, the Galaxy S4 zoom looks weird, but so did the Note not too long ago. The Galaxy Camera has yet to report stunning sales numbers (9 months since launch) and the Galaxy NX might be too pricy to risk it. 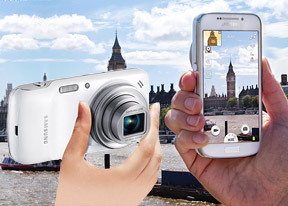 The Galaxy S4 zoom, however, lets you be an early adopter without a huge investment. At worst, you have a nice point-and-shoot with phone calls and data. At best you have the future. Now.